Customer service is our top priority at Craft Supplies USA. We take great pride in providing our valued customers with unrivaled service, top quality products, and hassle-free returns. We make every effort to make sure your experience is so good that you're eager to do business with us again. Our guarantee is simple… if for any reason you're not completely satisfied with any product, you can return it for a prompt refund or replacement. No Risk, No Hassles, Guaranteed. We do our very best to offer the quality products available. We carefully evaluate every product for quality, performance and value before we make it available to you, our valued customer. If a product doesn't meet our standards, we won't offer it, period. These premium quality Torx wrenches are the same as those recommended by Mike Jackofsky for use with his Hollow-Pro Hollowing Tools. 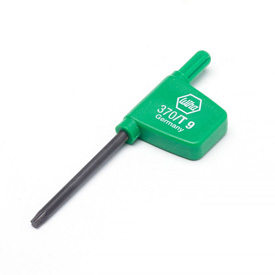 The flag style handle makes getting a positive grip easy when changing carbide cutters. Talk to our friendly, knowledgeable staff about all your woodturning needs. Sign up to get Craft Supplies USA special offers, how-to articles, new products and more. We back all our products with a 100% Satisfaction Guarantee.